bl.uk > Online Gallery Home	> Online exhibitions	> Asia, Pacific and Africa Collections	> Bashir-bagh Palace, Hyderabad. Photograph of the Bashir Bagh Palace, Hyderabad, Andrea Pradesh, taken by Deen Dayal in the 1880s, from the Curzon Collection: 'Views of HH the Nizam's Dominions, Hyderabad, Deccan, 1892'. 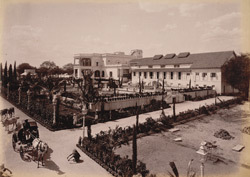 The Palace was constructed by Asman Jah who was Prime Minister of Hyderabad from 1887 to 1894. The palace has since been dismantled, however the area is still known as Basheerbagh.